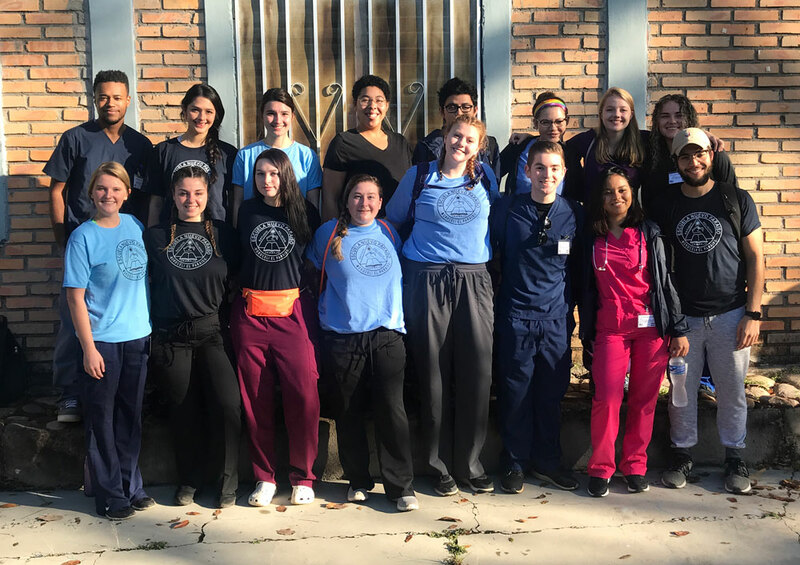 The one-of-a-kind experience of serving on a “medical brigade” in Honduras during the semester break will be shared by State University of New York at Fredonia students in a presentation on Friday, Feb. 15, at 3 p.m., in the Science Center’s Kelly Family Auditorium. For nearly a week in early January, 16 students (Morgan Baker, Shan Billups, Elisavet Boubaris, Brad Brown, Terron Brown, Lena Cambron, Lily Dixon, Kate Dotterweich, Kathryn Fink, Danielle Jacobs, Haleigh Moreno, Diana Olivares, Christian Pacheco, Alison Prendergast, Selena Ragland and Alexis Rodriguez) served as essential links in medical brigades that deliver primary care to underserved populations in perhaps one of the western hemisphere’s most impoverished nations. Experiencing how primary health care is delivered in a country that’s dramatically different from the United States and seeing the health problems of the patients were the biggest takeaways for the students, suggests Department of Biology Professor Ted Lee, who coordinated Fredonia’s inaugural medical mission to Honduras in the Study Abroad course INED 299 Honduras Health Care. It was also his second tour there with a student-assisted medical brigade. Professor Emeritus Joy Bilharz also traveled with the group and participated in the project. Sociedad Amigos de los Ninos, a non-profit organization that operates an orphanage that cares for about 140 children and other programs, hosted the Fredonia group. It operates medical brigades in small communities to deliver primary care in rural areas. More than 630 patients, mostly women and children, were seen by Fredonia students at the four brigades over a span of four days. At each brigade, students — all of whom are enrolled in biological science programs — were assigned to one of five stations. Each had its own function. They were: intake (compiling patient health care histories, identifying specific needs or concerns that warrant a physician’s attention); vitals (measuring pulse, temperature, blood pressure, height and weight); shadowing (observing doctors or physician assistant); pharmacy (distributing prescribed medicine) and play (organizing games and other activities with children while their parents were waiting to be seen by a physician). Fredonia graduate Jessica (Richards) Balarin, a physician assistant in the Albany area who accompanied the students, and Honduran physicians saw patients after vitals were taken. Students shadowed Ms. Balarin and Honduran doctors to observe and learn about the medical care being provided. Students enrolled in BIOL 250 Health Care in Latin America, taught by Lee, last fall to prepare for the journey. They were responsible for travel expenses as well as room and board and held an art raffle that raised $3,000 to pay for medicine they would be distributing. Lee, who also chairs the Health Professions Advising Committee, described the Honduran experience as a resounding success. “I think the students had a great time and learning experience; all were willing to stay several more days.” He would like to see the program offered on an annual basis at Fredonia.